The third annual Arthur W. Page Center Awards will honor New York Times executive editor Dean Baquet; the late Marilyn Laurie, former executive vice president of brand strategy at AT&T; and former Aetna CEO John W. Rowe. 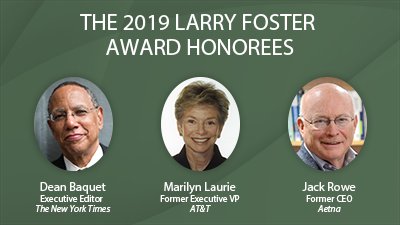 Each will be honored with a Larry Foster Award for Integrity in Public Communication at an awards dinner, which begins at 6 p.m. on Feb. 20, 2019 at the Grand Hyatt – Midtown Manhattan Hotel in New York City. This year’s honorees include a ground-breaking and Pulitzer Prize-winning newsman, a co-founder of Earth Day who also broke a glass ceiling at AT&T and a leading physician and influential CEO. This diverse class of honorees demonstrates the importance of promoting ethics and integrity across all areas of public communication. Although their careers were spent in very different roles, each is known for a commitment to integrity, according to the Center’s board of advisors, who reviewed the backgrounds of the nominees and voted to approve the awards. Honorees are known for telling the truth and upholding admirable values over long careers. Larry Foster, for whom the award is named, was a renowned communicator during his time as both a journalist and public relations practitioner. He founded the Page Center in 2004 with fellow public relations legends Jack Koten and Ed Block. The Page Center is a research center in the Bellisario College of Communications at Penn State, Foster’s alma mater. Visit the awards page for more information about past events and honorees.Two-hundred and thirty people from companies, universities, publications and other organizations attended last year’s dinner. Honorees share their stories and advice, and attendees learn about the Page Center’s mission to enhance ethics and responsibility in public communication. The annual awards dinner is a fundraiser that supports innovative research by Page Center scholars. Scholars represent universities all over the world. The Center’s research projects aim to build the scholarly and public understanding of ethics in communications. To date, the Center has funded more than 250 scholars and awarded more than $800,000 in research funding. Areas of focus include corporate social responsibility, digital ethics, sustainability communication, advocacy, fake news and more. Other Center initiatives focus on educational opportunities like an annual speaker series, oral history archiving and online educational modules. "Jack has been an inspirational leader for Aetna at a critical time in the company's more than 150-year history. He has not only led a remarkable turnaround and return to profitable growth, but also been a recognized national leader in health care policy."